There are a couple of events/thoughts/things waiting to be written about. Hopefully I will get my act together and write the blog post that accompanies the photo. 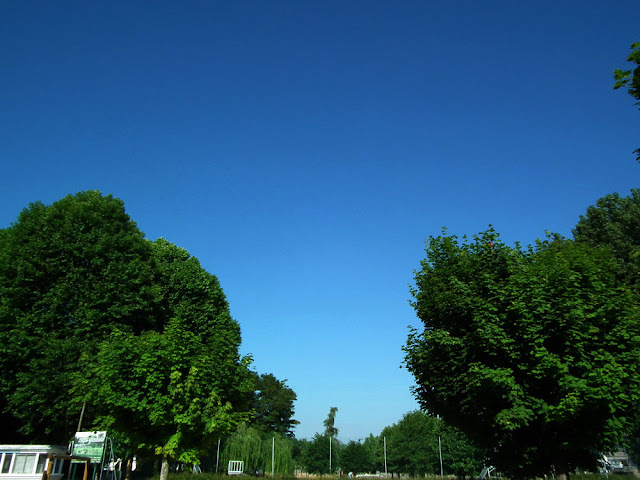 It's going to be hot this week - it will probably look like this. This feral Water Buffalo Bubalus bubalis is the only one I have ever seen, and I can assure you I was not as close to it as this photo makes it look. They have a reputation for being extremely dangerous. 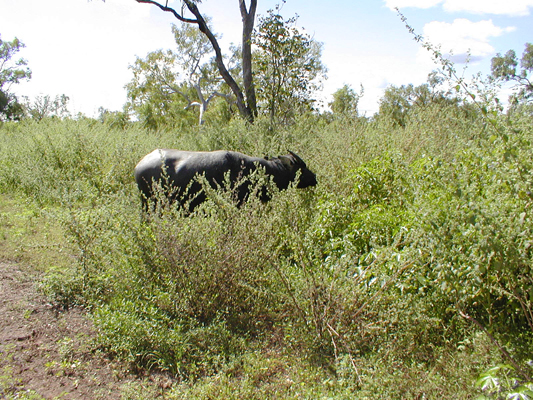 Water Buffalo were introduced to the floodplain country of northern Australia in the 19th century to provide meat for remote communities and other resources such as leather. When the settlements were abandoned so were the buffalo and they roamed wild, causing the spread of bovine diseases such as tuberculosis and brucellocis, and damaging wetland environments by trampling, wallowing and eating a huge quantity of vegetation. A concerted effort was made in the 1980s and 90s to eradicate them, especially from Kakadu National Park, and numbers fell dramatically but because of the terrain full eradication was not possible. However, according to the Department of the Environment's factsheet, numbers are again building. Some Aboriginal communities now depend on them for food, but they have no other natural enemies. French Expressions: Yesterday at the market my friend Louisa described her 9 month old grandson as having cheveux blond vénitien. I knew about the Renaissance fashion for bleaching dark hair blonde, which was all the rage in both Italy and France, but I had never heard this expression used in a modern context before. When I got home I looked it up. It turns out to mean what I would call 'strawberry blonde' in English. 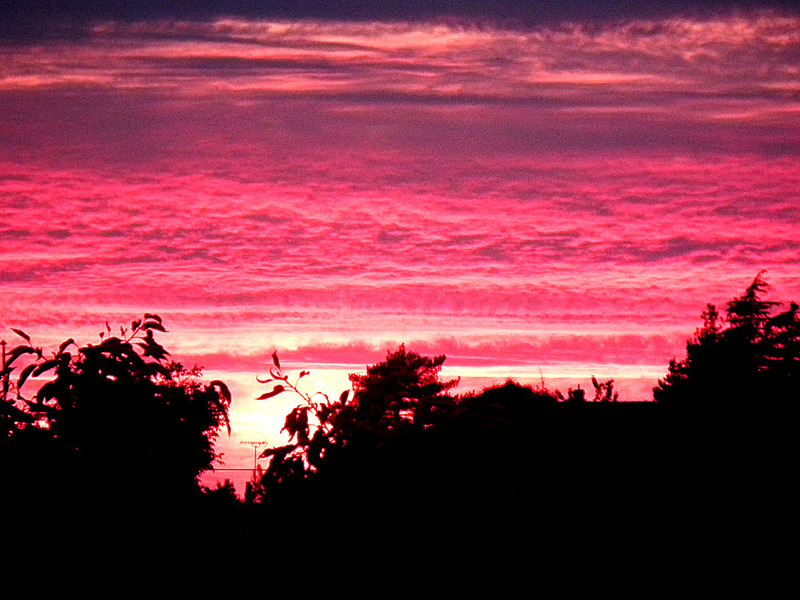 I may be wrong (it happened once before in 1978) but I believe that last night's sunset was the latest for 2015. All this depends on your lattitude, and exact timings are difficult to come by, but I think that's what I was being told by the interwebs. A couple of weeks ago we were using Célestine for work, After leaving the clients I turned the ignition, and instead of the fuel gauge showing me I had 3/4 of a tank it showed nothing. In fact, it showed less than nothing - the needle didn't budge. We drove to the station service, filled her up, and the gauge showed just over half full, but by the time we reached the garage (about 5 minutes away) it had dropped to almost empty again. A week later the gauge was resolutely stuck on "not saying", except for the occasional time when it showed half full. This was annoying, and meant that every 150km I was filling her up, just in case. you turn the ignition on the gauge shows how much fuel you have. 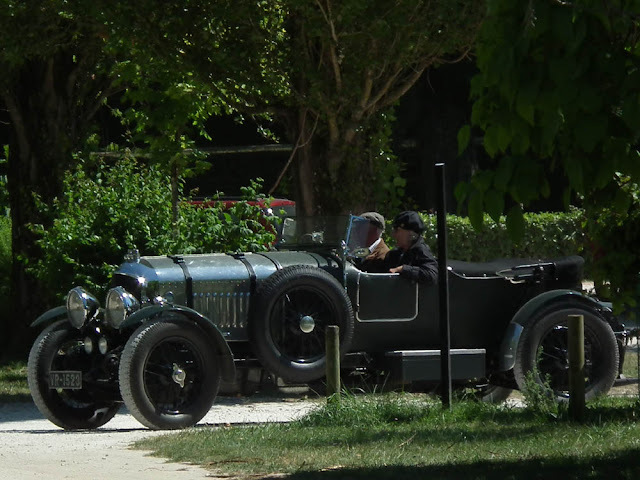 So having a spare day last week (and even though I was on my deathbed with the grippe) we went to Chateauroux and visited Jean-Louis. 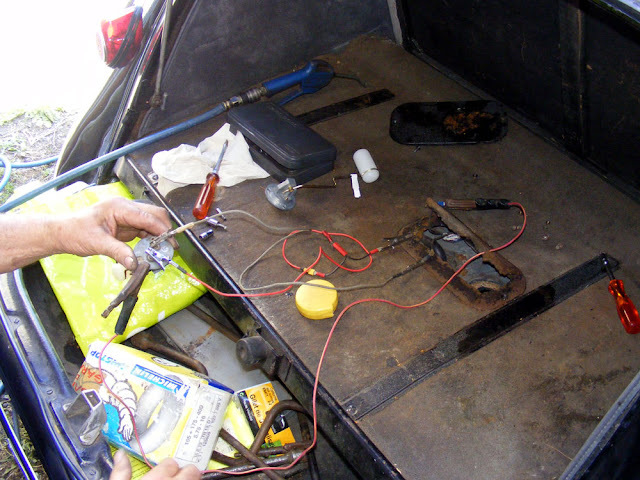 He decided the problem was the float in the fuel tank not floating (as opposed to the electical contacts at the top of the float being dodgy, which was the other option). A bit of a clean, a spot of calibration, and suddenly we had a working fuel gauge that shows full when the tank is full: a first, before that it only ever showed 4/5 at most. 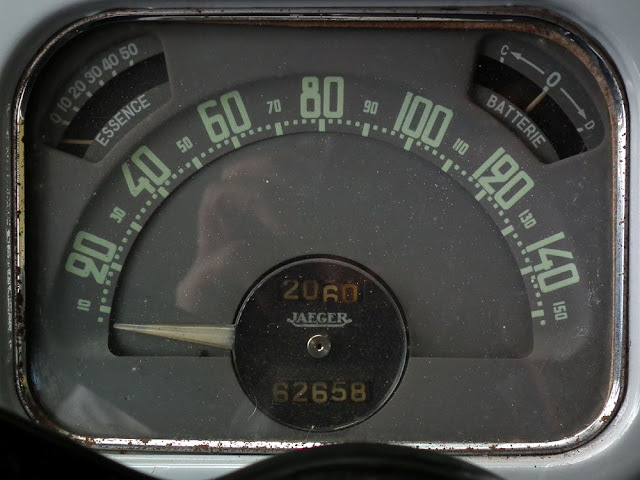 Also, it appears that at some stage the gauge had been installed the wrong way around so the float was near the edge of the tank, meaning that any slight movement of the fuel made the needle flicker all over the shop. Now the float is in the middle it doesn't wobble all over the place. I have always been envious of the window boxes it seems like every other house in town has, but after 5 years of trying I think I have worked out how it's done. The secret appears to be to put in twice as many plants as you think the box will hold. Of course then you have to water them every day, not always easy when you're working away from home for a couple of days, but so far so good. Domaine Charles Joguet is ostensibly based in the tiny village of Sazilly, between Chinon and l'Ile Bouchard, but in fact they have small parcels of vines scattered all over the AOC and they have a magnificent underground 15th century cellar near Marcay. Céline, who works at the estate tells me they've taken the precaution of buying the land over the cave too, as apparently the owner of the underground is responsible in French law for any problems topside. 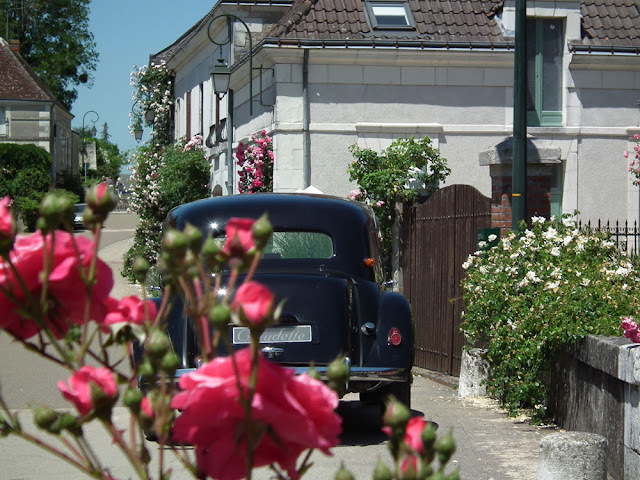 Charles Joguet, who took over the family winery in 1957, has been gone for some years, having retired in 1997 to go back to being a full time artist, and the Domaine is now owned and run by the descendents of his business partner, the Genet family. Joguet was not a winemaker, but had trained as an artist in Paris. When he returned to Chinon and picked up the reins he was viewed as an upstart, an outsider, and with his modern ideas about winemaking in a deeply traditional area was the object of considerable local scorn. By recognising the effect of terroir and his conviction that with a more nuanced approach he could make great wine he more or less single handedly created the reputation Chinon AOC enjoys today. He was the first Chinon winemaker to separately vinify different parcels of vines and to bottle and commercialise on the estate. The Genet family continue the innovative and somewhat rebellious tradition of their predecessor with passion and sensitive attention to detail. The aim is to make the highest quality wines they can whilst expressing the rich diversity of terroirs in the Chinon AOC. Like all Chinon winemakers their main production is cabernet franc, but they also do a bit of chenin blanc sold as Touraine AOC. The Charles Joguet range of wines lined up for a tasting session. Like all good winemakers they know that quality starts in the vineyard itself. They go to the extent of working with the National Agronomy Research Institute (INRA) to analyse every parcel and develop a management plan for each. One of Joguet's radical ideas was to produce highly distinctive wines from single parcels, not blending from different terroirs to produce something more generic. Since 2008 the Domaine has been in transition to being certified organic, but have chosen to wait a little before official certification to see how the system settles in the vineyard. At harvest time they ruthlessly and precisely sort the grapes so that only those in the best condition get through to the press. Over time they have slowly begun delaying the sale of their wines so they are aged longer in the cellar. They are aiming for balanced, harmonious wines with rounded tannins that are not bottled too early. This rigorous approach has been difficult in the last few years, with 2012 and 2013 yields drastically reduced. They remain upbeat though, and convinced that the resulting wine speaks for itself. 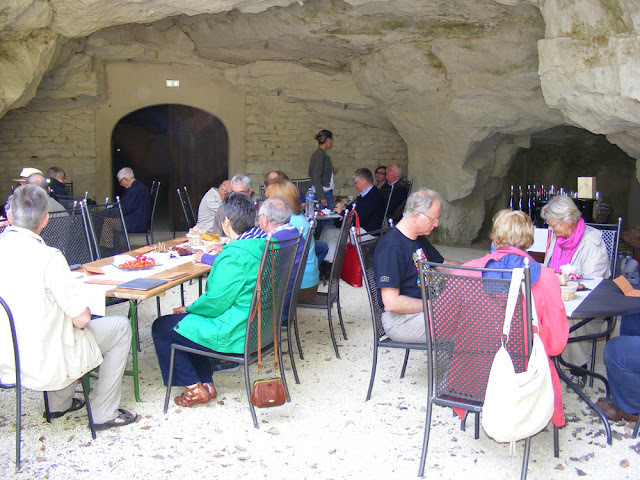 The Charles Hasting Wine Club tasting in the magnificent cave at Marcay. Fully equipped with toilets and a barbecue, its only disadvantage is that it is so damp Céline (middle back) can't leave anything there that might go mouldy. Cuvée Terroir - €9/bottle, now renamed Silene, after the French name for Sand Catchfly, a rare wild flower which has reappeared in the sandy soil of this parcel since going organic. This sandy soil imparts a classic leafy but fruity cabernet franc, matured in stainless steel vats and to be drunk young and cool. Cuvée de la Cure - €15/bottle. The Domaine advise keeping this another 6 months before drinking and it has the potential to keep for 10 or more years. They didn't make any of this wine in 2013 because this parcel was badly frosted. The vines from this 2ha parcel were planted in 1974 on an alluvial gravel terrace over clay just in front of the church in Sazilly (south bank of the Vienne). It yields about 45 hectalitres per hectare. Les Varennes du Grand Clos - €23/bottle. Below the gravel terrace, this 4.5ha parcel of vines were planted between 1962 and 1972 on flinty clay chalk deposited by the erosion of the slope above. They yield about 40hl/ha. In the depths of the cave. I didn't notice the graffiti until I processed the photo. Clos du Chene Vert - retails for €30/bottle. This wine is aged for 18 months in oak and should be served warmer than the Silene. 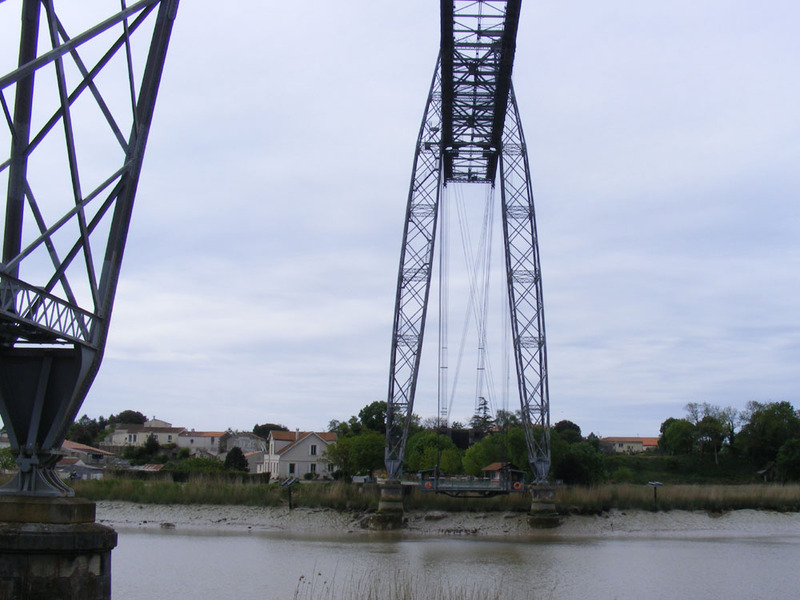 These vines are right in Chinon itself, on one of the most famous locations of all, on the north bank of the Vienne. 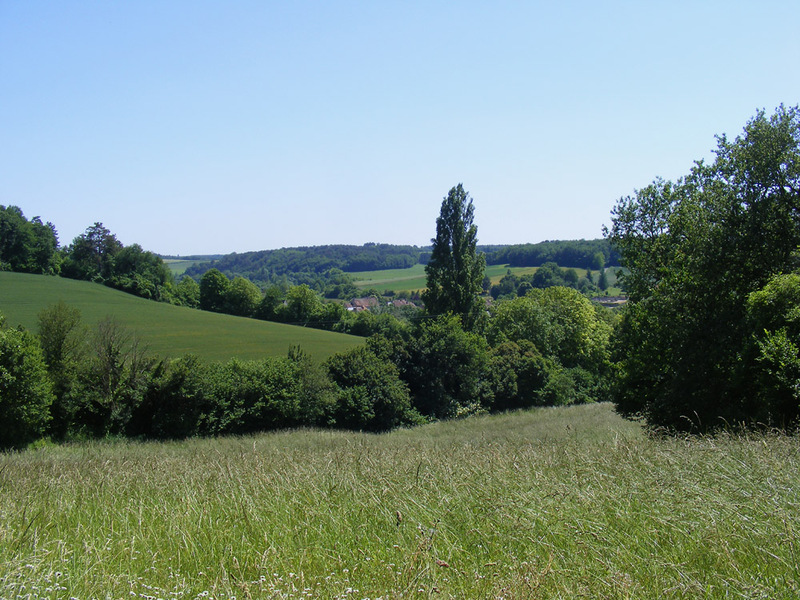 It's 2ha on a very steep slope facing south-west with clay and flinty chalk soil. The site takes its name from the enormous Holm Oak at the top of the hill, the regrowth from a tree planted more than 800 years ago by the monks of Bourgueil in the 12th century. It yields about 30hl/ha. When Charles Joguet bought the parcel in 1976 it had been a vineyard for a thousand years, but was at that time abandoned and overgrown. He had no money and it was the other side of the river to the rest of his holdings, 12km away from the winery. It didn't seem like a very practical acquisition. Not being able to afford a tractor, he ploughed it with horses. Clos de la Dioterie - the Domaine's most famous wine, made from 80 year old vines (the oldest on the estate). It's aged for 22 months in oak barrels. This parcel is a little more than 2ha, right next to the winery and overlooking the Varennes parcel, facing north-east, which is apparently perfect for maturing cabernet franc grapes. The soil is very calcareous clay. These very old vines don't yield much (only about 30hl/ha) and are the object of particularly attentive care. Clos de la Plante Martin - this is a dry chenin blanc, sold as Touraine AOC, which undergoes a slow maceration at 8 degrees centigrade. 30% of the wine is aged in new oak barrels then blended with the rest. It was absolutely superb with a thin apple tart glazed with red wine jelly. The vines were planted on this limestone clay slope between 1994 and 1999 and is an area of slightly more than 3ha, yielding no more than 30hl/ha (often less). 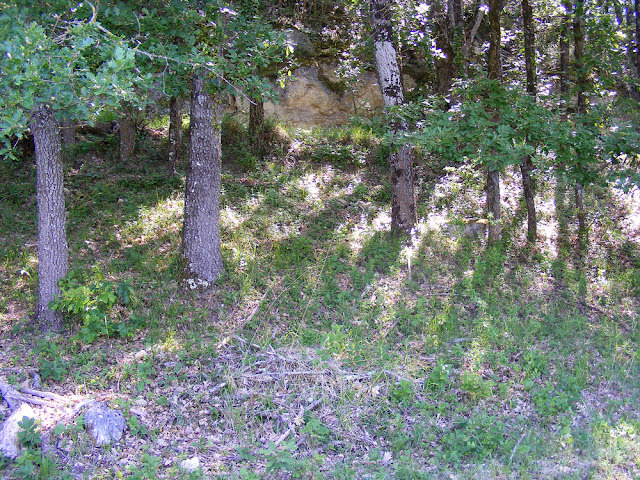 Between Les Varennes du Grand Clos and Clos de la Dioterie is an open strip of land. In 1982 Charles Joguet got permission to plant ungrafted vines here. It is often forgotten that the prize for eradicating phylloxera has never been claimed, because it has not been eradicated, only controlled, and the disease still kills vines every year here. These vines of Joguet's, unprotected by robust rootstock, were finally grubbed up in 2008, having succombed to phylloxera. Charles Joguet is a legendary name in Loire Valley wine circles, and he seems to have been an inspired winemaker. However, his successors seem to have divided the wine world into those who feel they are not living up to his reputation but simply trading on it, and those who have such reverence for the man that they remain uncritically loyal to the brand. I'm not an impartial nor a terribly informed judge, since I am no great fan of cabernet franc and Chinon AOC in particular. However, I do love chenin blanc and thought that the Clos de la Plante Martin was extremely good. I also think that their current approach to vineyard management can only be good and there is no question that their wines continue to reflect the effect terroir can have on a wine. We've both had dreadful colds, but a slight glimmer of feeling human is starting to show. What with catching up with things and feeling poorly, the blog has kind of slipped a bit. So in the meantime, some lettuces. 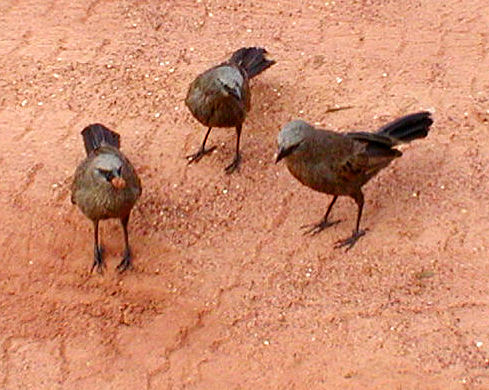 Apostlebirds Struthidea cinerea live in family groups in inland eastern Australia. They are chummy and entertaining, clacking and chattering their way across the ground feeding on insects, and not particularly wary of people. These ones are part of a separate small population that lives in the Northern Territory, but I grew up with Apostlebirds everywhere in the Belah Casuarina cristata woodlands of the Darling Downs. They are the only member of their genus and there are only two species in their family, both endemic to Australia. They nest communally in a mud nest presided over by a dominant male and female, assisted by numerous young helpers. Occasionally, when a group becomes too small, they have been observed kidnapping the young of other groups and raising them as their own. They got the name Apostlebird because they hang out in social groups of about a dozen (but it can be anywhere between 6 and 20 birds). Yes, even with colds. Susan now has very little voicebut we're both feeling slightly better. Chedigny, three days after the Festival of Roses. We have finally bought a new (old) modern car. It's a 2004 Ford Fusion with a 1.4 turbo diesel engine at 160k on the clock. 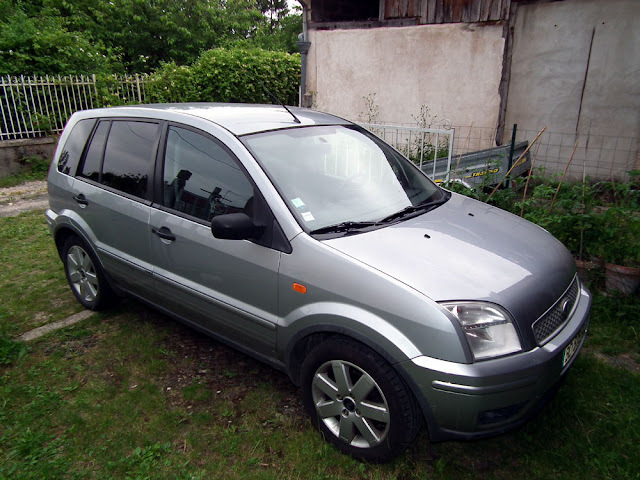 It's a taller version of the Ford Fiesta so smaller than our current modern, but still big enough for me to fit into. Not a fancy car, but we hope it will be a good workhorse for days when one of the ladies isn't the best choice. It is, of course, silver: one of the three colours one is allowed if one buys a sensible car (the other options being white or black). No doubt that means we will lose it in the carpark at Auchan, but them's the breaks - at the price we paid you don't get all the options. We did try a slightly more stylish car, a Fiat Punto. 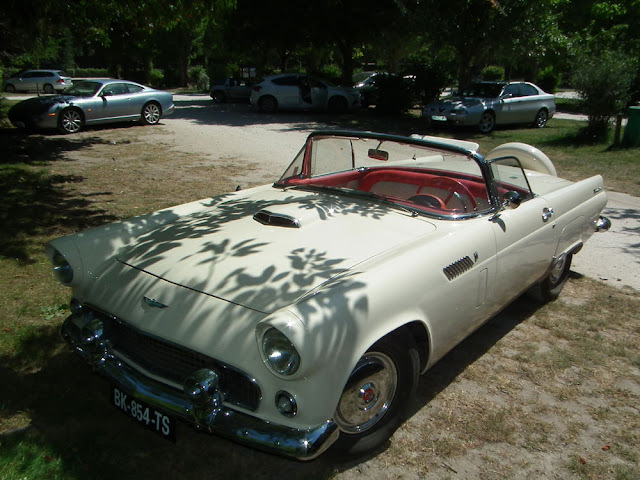 They are a pretty little car, and we looked at a well priced example and were sorely tempted - until I drove it. 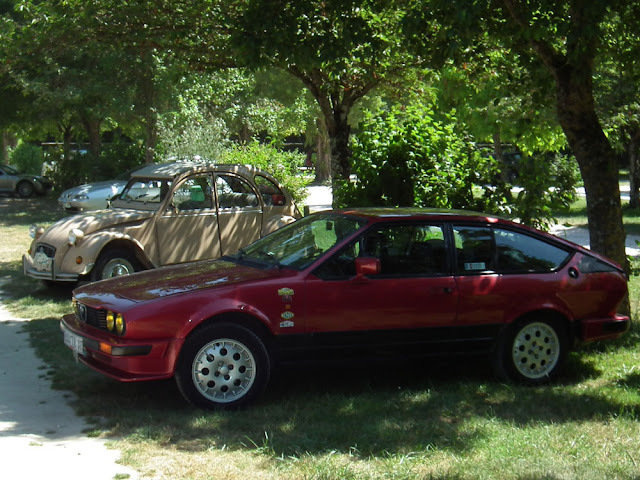 It was than that I discovered what people mean when they say they don't like electric power steering: it felt like I was playing a 1980s computer game, with no idea where the front wheels were pointing or how much I had turned the steering wheel. I like an an adventure, but that was just plain scary. 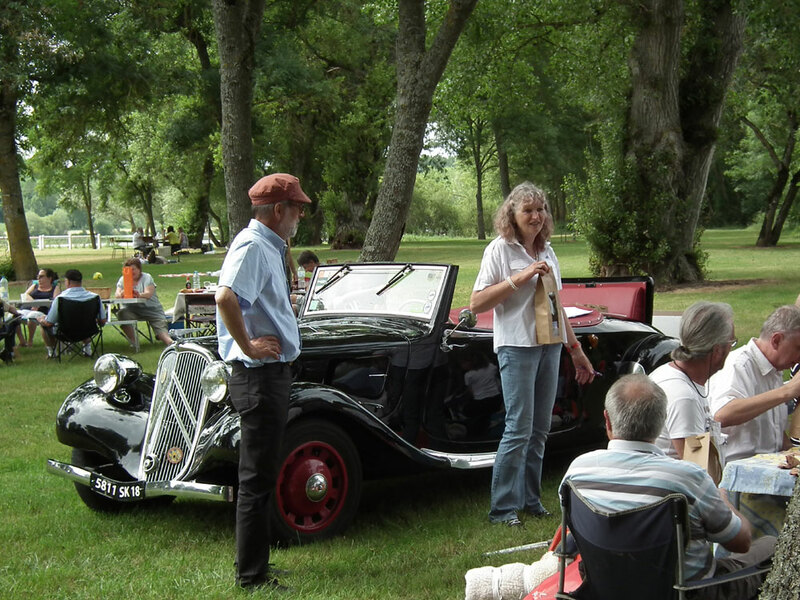 Last Sunday la Traction Universelle Centre celebrated 35 years of activity with a pique-nique at Quincy, on the river Cher near Vierzon. We went in Célestine and joined 35 (or so) other Traction Avants of varying body styles and ages. Recently I visited Benoit Daridan's winery just outside of Cour Cheverny. 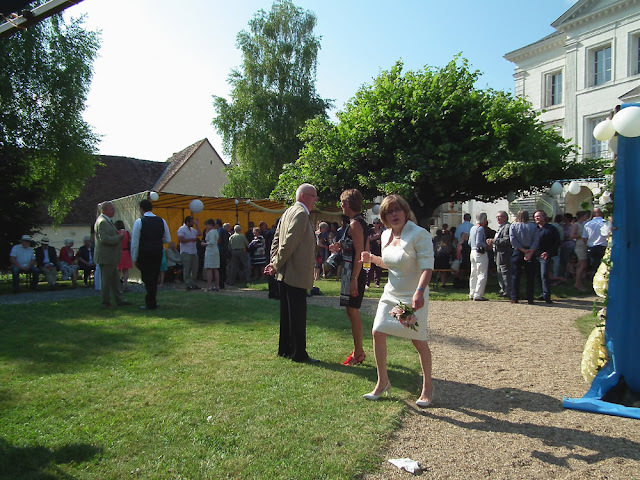 We had been given a bottle of his Romorantin Cour Cheverny wine some time ago by friends Rosemary and Jean Michel, and I was curious to visit the winery itself. 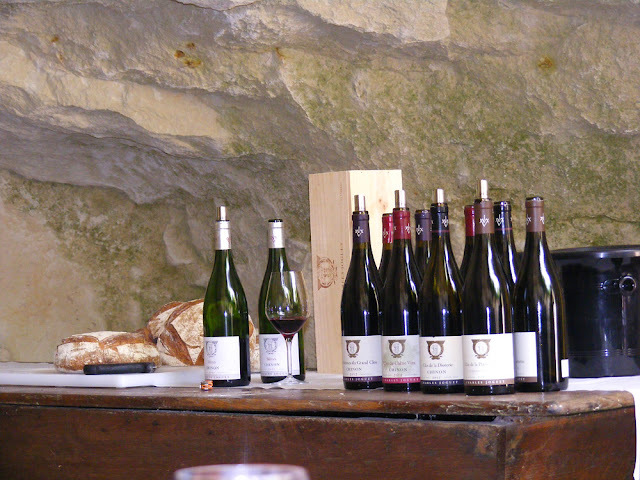 The visit of the Charles Hastings Wine Club and my role in designing their tour of the Touraine Loire Valley offered the perfect opportunity to have a tasting session at the Domaine. 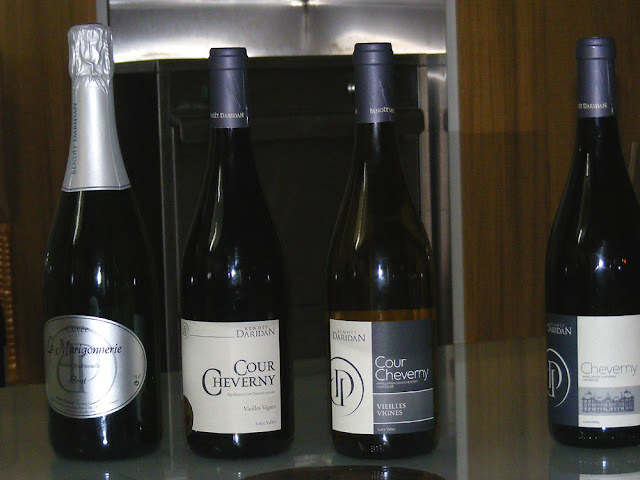 The Cour Cheverny Romorantin wines (centre). 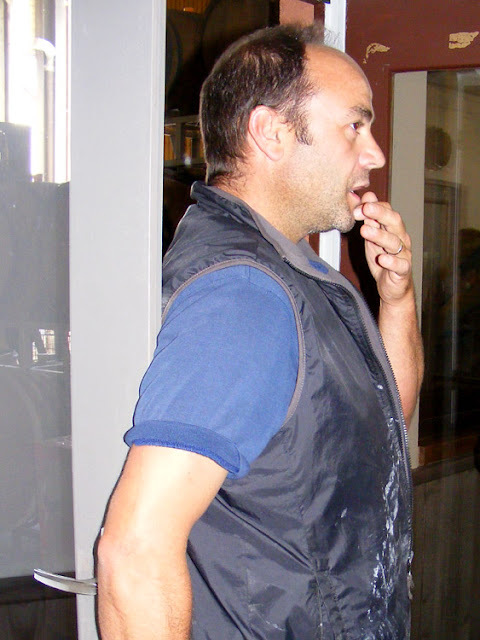 Benoit grows chardonnay and sauvignon blanc white grapes and pinot noir and gamay reds which he sells under the Cheverny AOC. More unusually he also grows a rare grape variety called Romorantin, which is the only grape variety allowed for the tiny Cour Cheverny AOC. 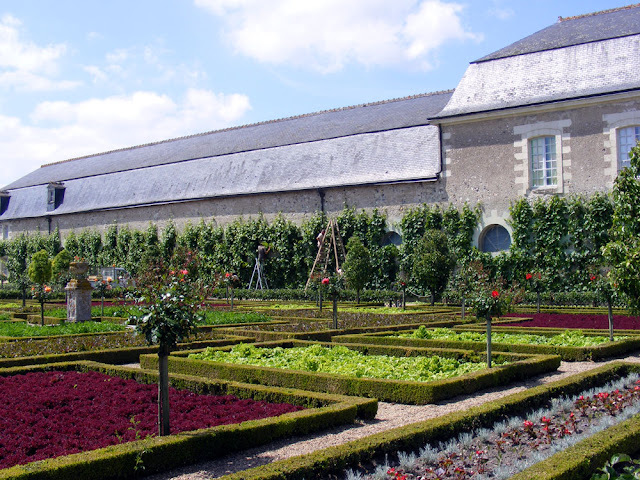 It was introduced by Francois I and planted in the garden of his mother Louise of Savoy's chateau at Romorantin. Several parcels of Benoit's Romorantin grapes are more than 50 years old. His vineyard is managed using the principles of agriculture raisonnée (a type of pragmatic organic approach). 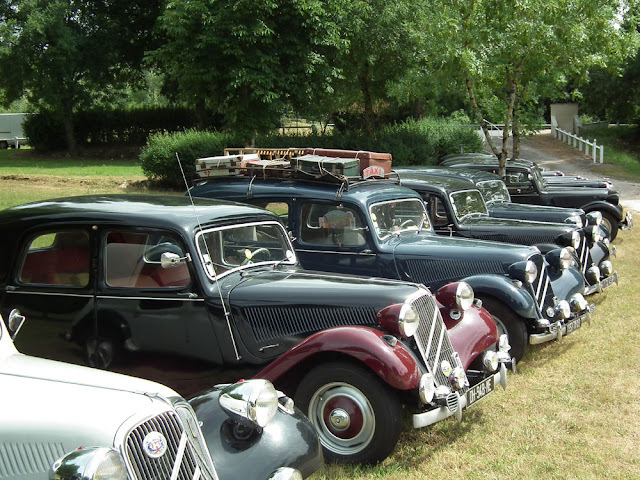 The estate is 15ha, on flinty clay soil, situated between the chateaux of Chambord and Cheverny. Two hectares are planted with the Romorantin vines. Benoit is the seventh generation of his family to run the winery and took over in 2001. Benoit listens carefully to a question about the wines. The white wines are matured in Loire oak barrels (unlike the Touraine and Vouvray producers, who use barrels from Cognac) and he exports to Cananda and the USA as well as selling in France. 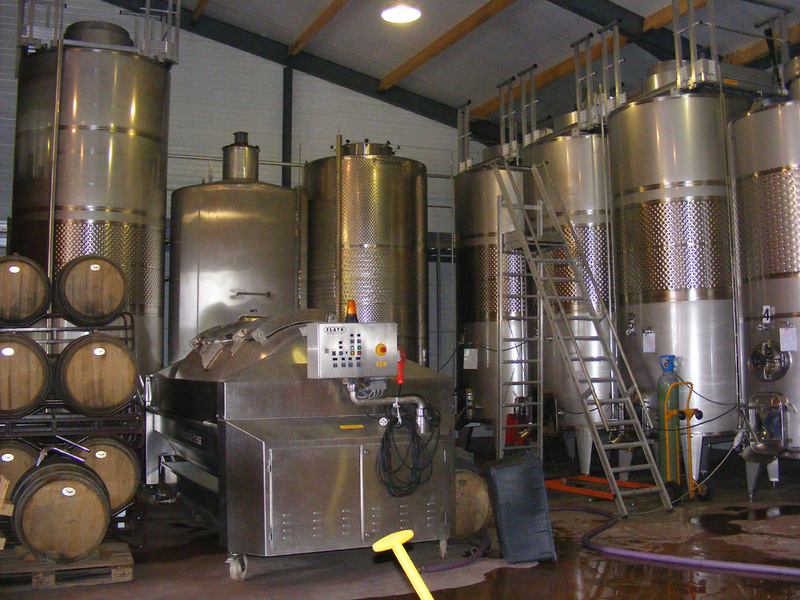 His production is about 120 000 bottles a year, 60% white, the rest rosé and red. The rosé, and some cabernet sauvignon red that he makes, are not AOC, so are sold as vin de table. His 2012 rosé is 70% pinot noir, 30% gamay, dry, fruity and fresh. It would go well with barbecued foods and salads. The 2013 Romorantin is from 50 year old vines and barrel aged for 3 months. It's fruity, still young, but already complex. He reckons it will be good to drink for up to 10 years. 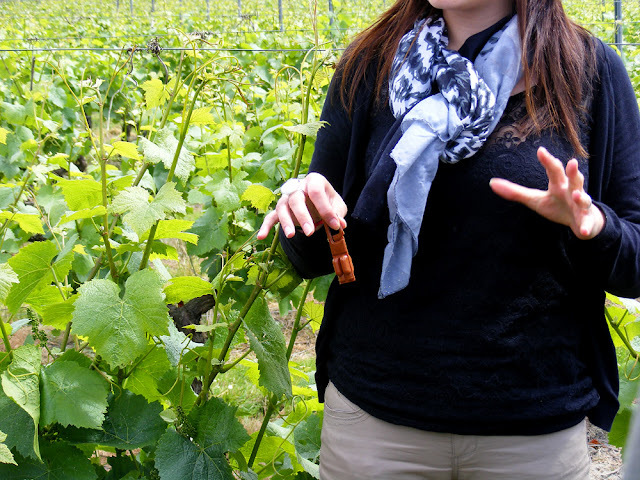 There are just 55 ha of Romorantin in the world and 10 000 bottles produced every year in total in the AOC. It pairs well with asparagus and goat cheese. The wine we tasted had good length and was well rounded and balanced. Sadly, it struggles to compete in the wider market with the sauvignon blanc grown alongside it and chardonnays from other AOCs because its character is too subtle and not distinctive enough to easily promote. Its value is as a rarity and a local delicacy for the initiated. You will not see it for sale on the big wine merchants' shelves or in the supermarket. Benoit's Cheverny white is a blend of 20% chardonnay and 80% sauvignon blanc. This is an unusual mix but he achieves it very well (better than, for example, some Australian blends of sauvignon and chenin blanc, where the chenin is used because it is cheaper). Benoit has worked in New Zealand and is used to (and interested in) malolactic fermentation to soften the acidities in white varieties. This differentiates him from his neighbours, who make old fashioned super acidic whites. He prefers to make a modern style of wine. a control for vine moth caterpillars in the vineyard. His 2013 red blend of pinot noir and gamay is light and fruity. It is given 3 months in oak and has a little tannin. He says it is best kept for a maximum of 5 years and goes well with meat, charcuterie and barbecue. The winery can be visited on appointment every day except Sunday and Benoit and his assistant Mélanie speak English. Tasting sessions which include a visit to the vines and a tour of the winemaking facility cost €5 per person and take about an hour. Back in March I was contacted by David Armstrong asking if I could help him with a project he was involved with. 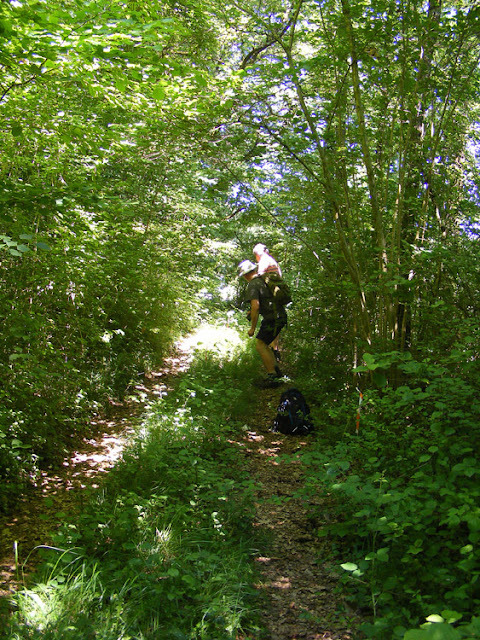 He'd found me by searching for 'Red Helleborine France' and come across the blog. He and his colleagues wanted to visit France and study the Red Helleborine Cephalanthera rubra. By doing so they hoped to learn more about its ecological requirements. Red Helleborines and other orchids often grow in the middle of woodland tracks, probably because the light levels suit them. It just so happens that where we live is a bit of a hotspot for this rare orchid. It's rare and protected even in France, but there are half a dozen good colonies around Chaumussay in the Claise Valley, and a couple at Panzoult in the Vienne Valley, as well as other scattered records throughout the département of Indre et Loire. In Britain though it's even rarer and there are perhaps 30 plants left in the whole of the UK. David is a warden with the National Trust and is responsible, along with his team, for the management of most of the UK's remaining Red Helleborine. The Claise Valley at Chaumussay -- prime orchid habitat. Some years ago, when it was obvious the situation for the survival of this plant in Britain was desperate, the UK Red Helleborine (Cephalanthera rubra) Restoration Group was set up. This group is dedicated to the conservation of the remaining population, their restoration and reintroduction. The group includes members from the National Trust, a large heritage and nature conservation charity, Natural England, the government body responsible for policing protection legislation, providing advice on the management of sites, and funding research, and the Royal Botanical Gardens at Kew, a world reknowned botanical garden on the outskirts of London. Kew is engaged in researching how to propogate the species, but it is not proving easy. The plant is classified as critically endangered in the UK. 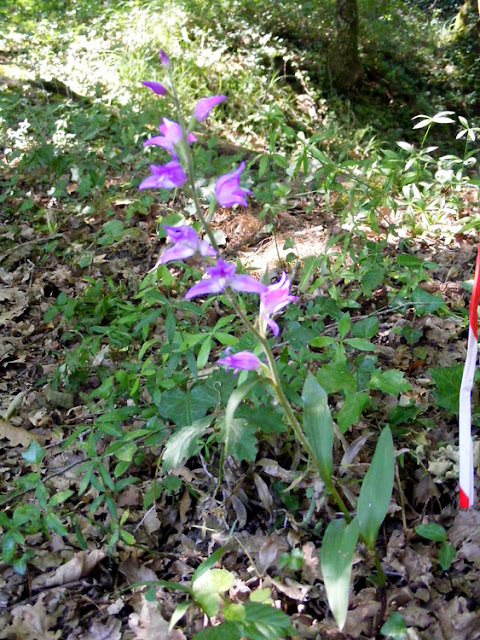 Red Helleborine on a privately owned site at Les Reuilles. 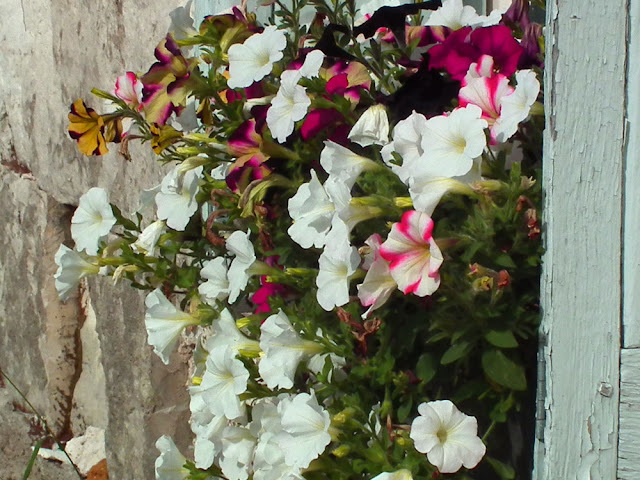 No viable seed is being naturally produced by the British plants, and even when hand pollinated success is not high. Kew is struggling to germinate what seed there is and the seedlings are feeble. The group decided to visit Europe to see established and thriving wild colonies. They hoped to get ideas on how to manage their sites and make contacts for future networking. One of the most likely outcomes is the possibility that they will apply for permission to collect seed in France and thus allow the research into germination to continue. 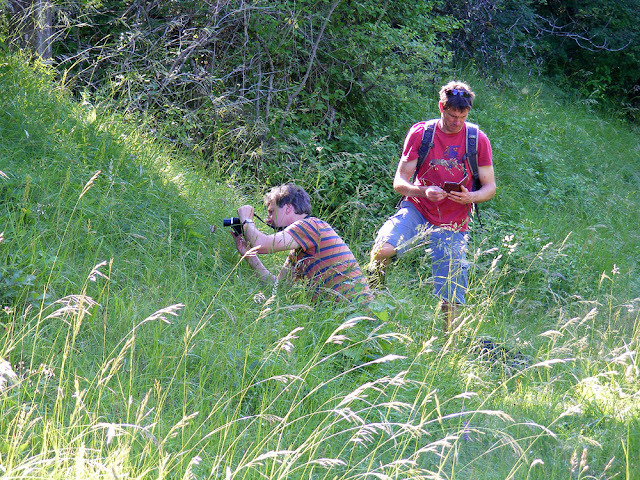 David and Tim photographing rare Military Orchids on a roadside bank near Chaumussay. Before David and his two fellow wardens visited, my orchid expert friend Marc Fleury and I checked out the local sites and marked plants with red and white tape. After they arrived I took them to all the sites and they studied them for clues as to what their plants were lacking. Marc wasn't able to join us, but our friend Jean Pelle, also a well known local orchid expert joined us for the first morning. Typical Red Helleborine habitat at Panzoult. It was quickly obvious that there are differences between the English and the French sites. In England I'm told that the species grows in mature Beech Fagus sylvaticus woodland on sloping limestone sites with thin soil, in quite heavy shade and with little other vegetation. 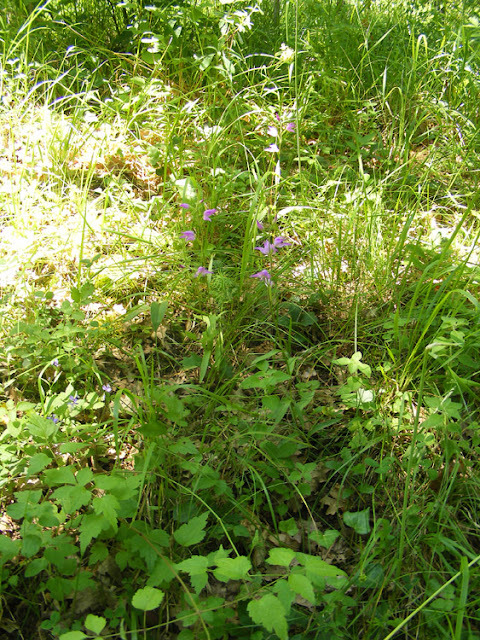 In France the orchid grows in dappled shade from Downy Oak Quercus pubescens woodland on south facing limestone ridges, in association with Juniper Juniperus communis and many other grasses and wild flowers of dry limestone sites. These French sites are often old sheep pastures, used to graze sheep because they were too steep to plough. The thin soil is low in nutrients, alkaline but close to neutral. According to Marc, there are often truffles under the oaks, and a heavy fungal parasite load, leading to the oaks being stunted. His observation is that where you find one Cephalanthera species you are likely to find the other two (Narrow-leafed Helleborine C. longifolia and White Helleborine C. damasonium). 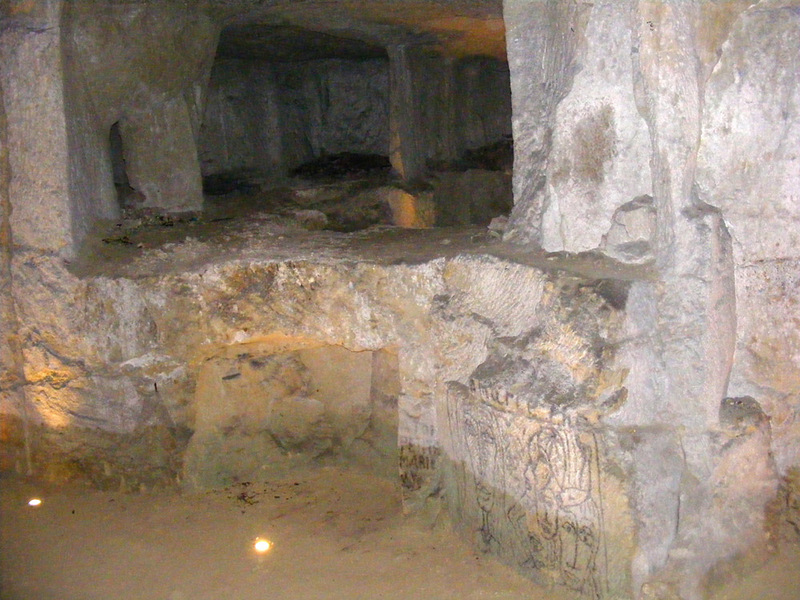 Also common to the French sites is man-made terracing in the limestone, and the French specimens seem to enjoy a little more sunlight that the British ones currently get. Red Helleborine growing in a shaded grassy location. We only found one Beech tree over the two days, a mature specimen at Panzoult, and not clearly associated with the orchid. Beech is not a common species here, probably because it is too hot. On the other hand, Downy Oak does not occur in Britain, probably because it is not hot enough. A Red Helleborine flower visited by an insect. My impression was that it was a fly, but it might have been a bee. In any event it did not emerge with pollenia attached, so it is presumably not a pollinator. 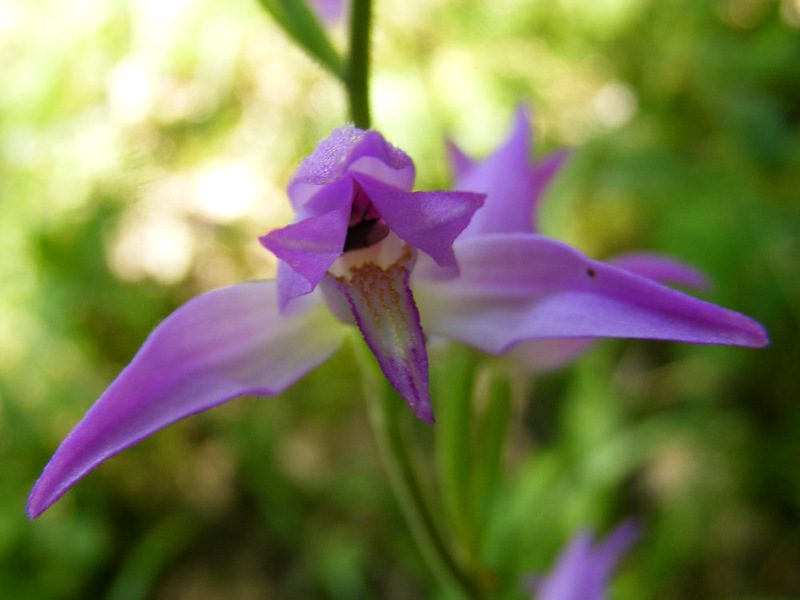 Kew has not yet investigated what mychorrizal associations the orchid has, but a lack of the right fungal partners in the soil is one possible explanation for their failure to thrive in England. Another explanation could be that they have lost their pollinators. In France they have been observed to be pollinated by male bellflower carpenter bees Chelostoma spp as well as other hymenoptera. The research team had a great time. They had never seen so many Red Helleborine, nor such large ones with so many flowers. They also got to see 20 other species of orchid, some of which they had never heard of before, or never seen before. It was a real reminder to me that what we have here is truly special. Orchids that we almost take for granted, such as Lizard Orchid Himantoglossum hircinum or Monkey Orchid Orchis simia are really rare in Britain, and even in other parts of France. Others, such as Small-leafed Helleborine Epipactis microphylla and Violet Limodore Limodorus abortivum don't occur at all in Britain, but can be found here if you know where to look. 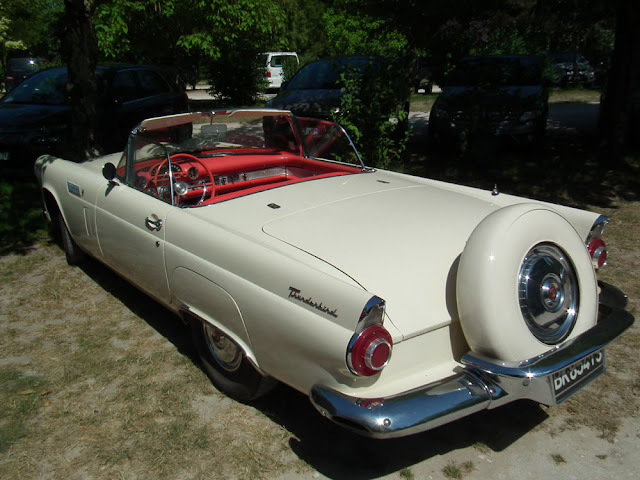 Ford Thunderbird (1955? ), which makes it the same age as our ladies. What a difference! 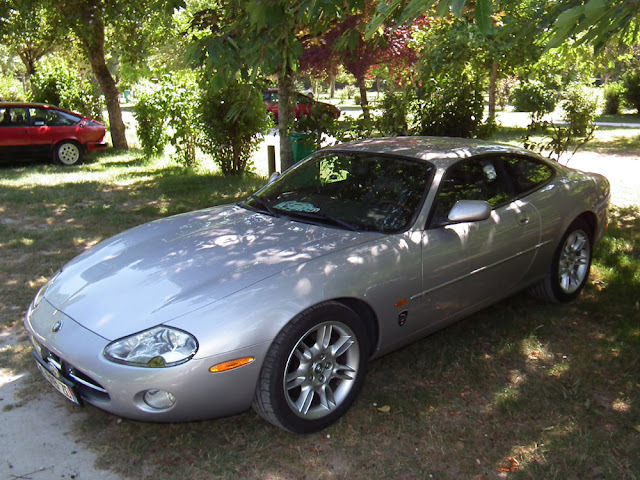 Jaguar XK (XK8 or XKR?) There were actually two of these in the car park. 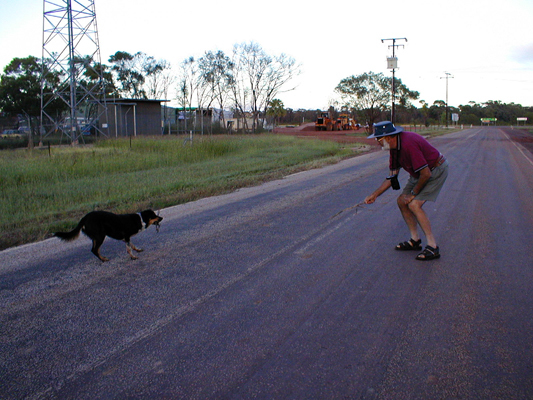 This is my Dad, playing with a dog in a small outback community a few years ago. The dog looks like a kelpie, an Australian breed of sheep dog. My parents have owned a couple of kelpies themselves. The current incarnation is called Bunji and is red, not black and tan like this one in the photo. 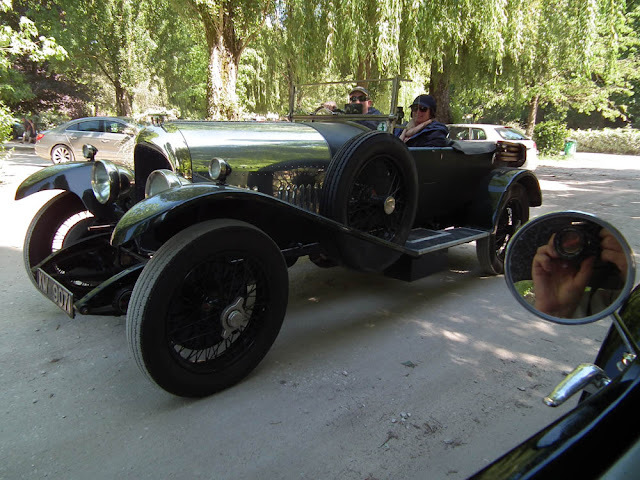 I have encountered Bentleys at Chenonceau before. Last Monday was a bonus day - not 2, but 4 of my favorite monster machines were present. The photos will show you how big the cars are - but give absolutely no idea how big the noise is. but now has a Townsend 4 seater body. 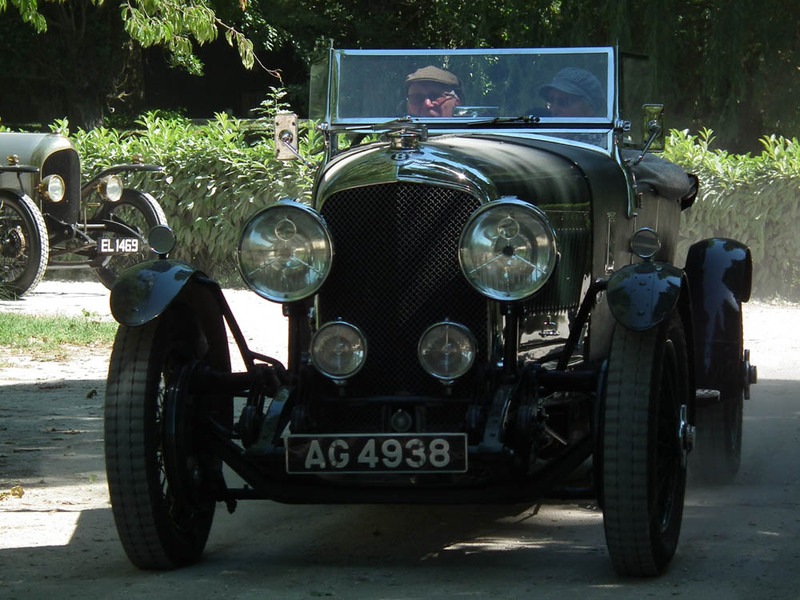 This is the joker in the pack: A relatively recently built 1926 Bentley 3 litre. 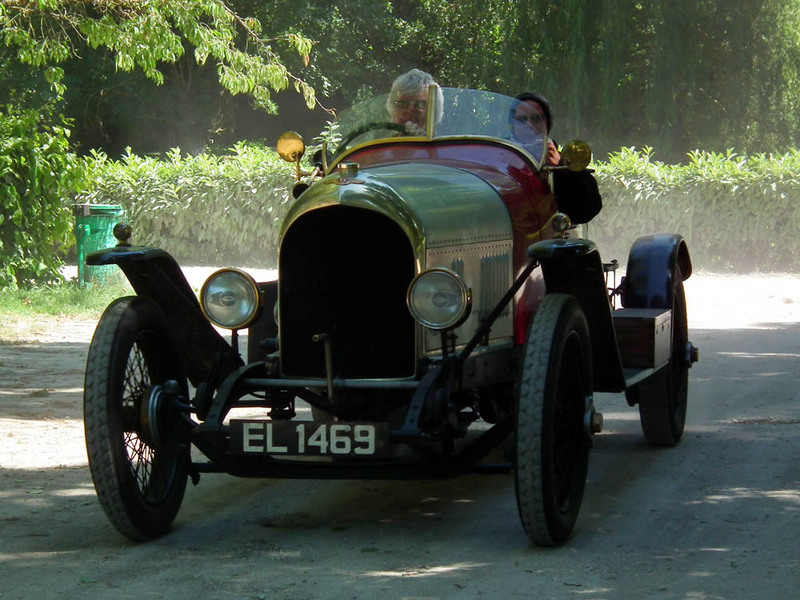 There was no way that we could afford to buy a 3 litre so we built one for ourselves. We started with the rear halves of 2 side rails, 3 cross-members and one rear spring hanger. Our friends Martine and Jean-Michel, who run the Hotel Restaurant l'Image in Preuilly sur Claise, got married on Saturday 6 June. 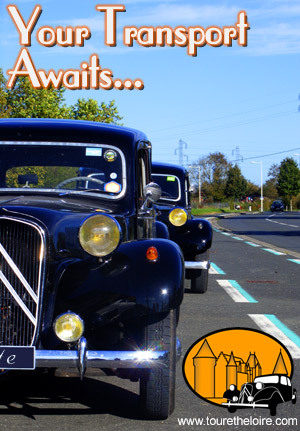 Just about the whole town was invited, but it was a simple affair. The crowd of guests starts to build up. 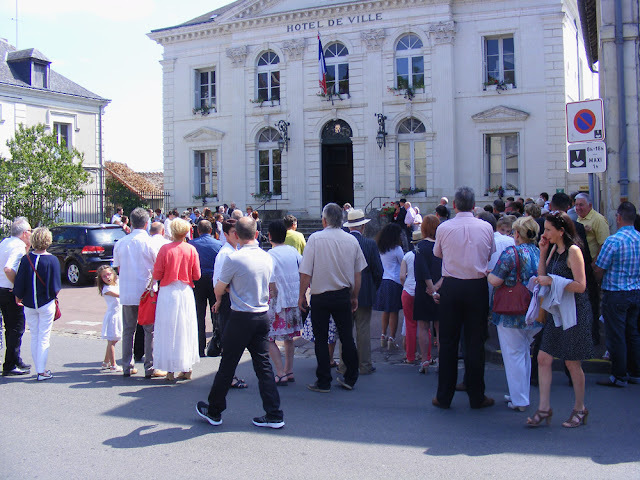 The ceremony was performed in the town hall by the mayor, then drinks and nibbles were served in the town hall garden. 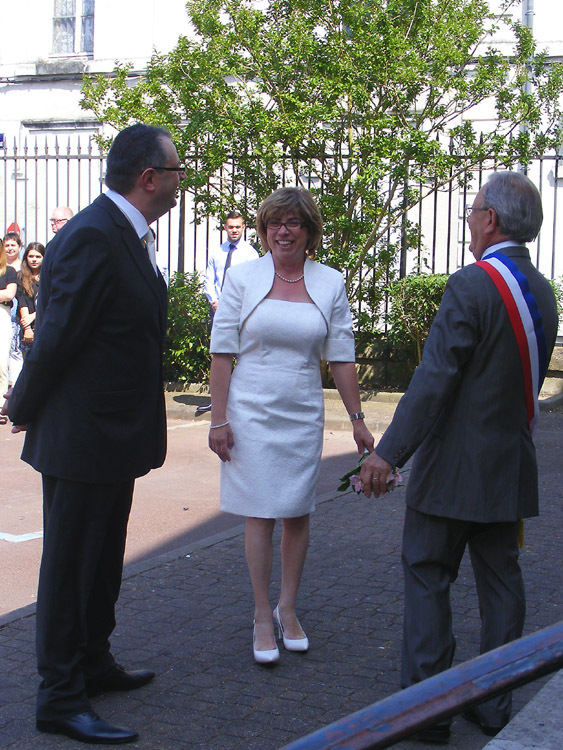 Martine and Jean-Michel talking to the mayor, Gilles Bertucelli, before the ceremony. 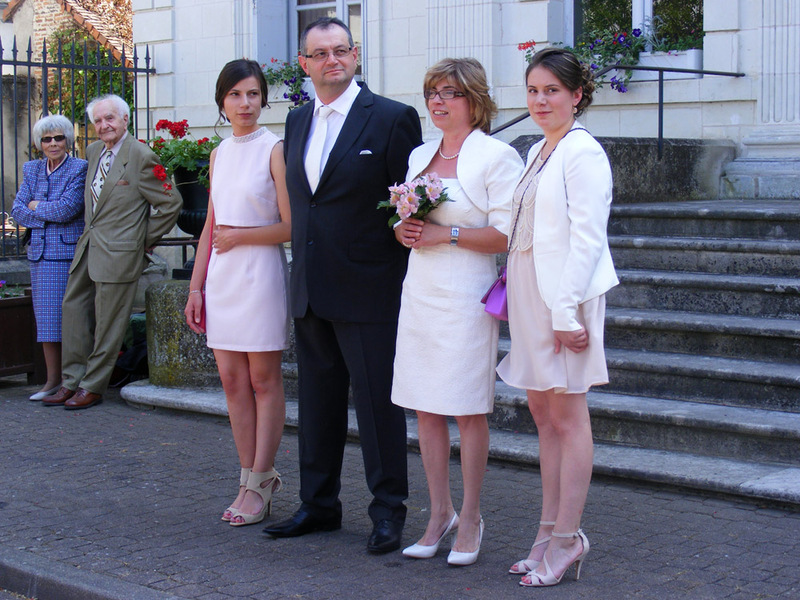 Jean-Michel, Martine and their daughters. Party in the town hall garden.